I’m pretty sure I might have found a restaurant that serves the best green chile in the state. Nay, not just the best green chile, but perhaps the best New Mexican food I’ve had. Okay, maybe that’s too bold of a statement. Besides, I haven’t eaten at every restaurant in the state that serves New Mexican food. There could be a lovely little place in Datil that really deserves the honor of “the best”. 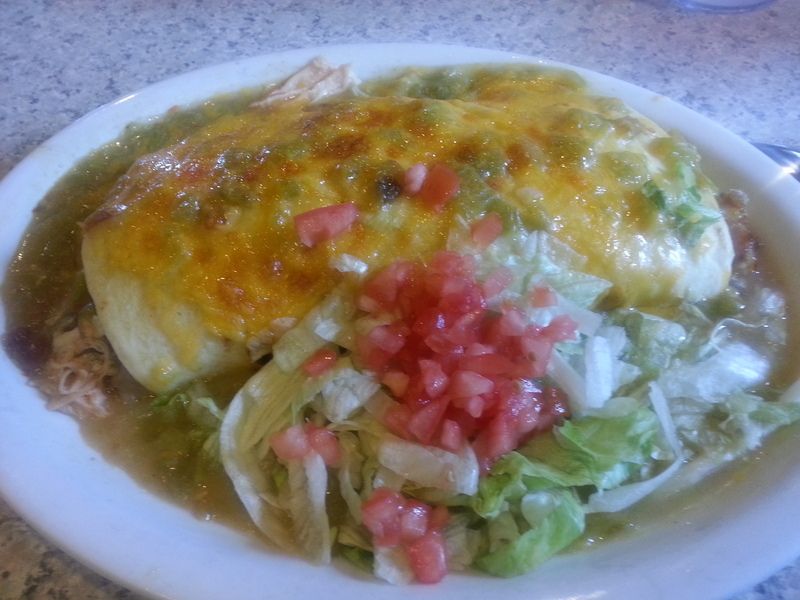 However, I am going to say that Horseman’s Haven Café serves the best New Mexican food and green chile in Santa Fe. A group of us went to restaurant after our rafting trip, based off of a recommendation of a friend. She did warn us to not be thrown off about the location. It’s located next to a gas station and from the outside looks like it could be an iffy place. But as I’m not particularly prissy, I was game. Besides, I was famished and had already started to secretly eye my friends to see which one’s arm I could gnaw off. The inside of Horseman’s has a typical country diner feel, with an open kitchen, plenty of tables and chairs and booths big enough to seat the nine of us. I think my friends realized their limbs might be in imminent danger as they kept placing the chips and salsa directly in front of me. The chips were thicker than most chips I’ve eaten at restaurants. The salsa was full of flavor and fresh. It also was less chunky than most salsa. But while it had flavor, it wasn’t particularly hot. Seriously, measure the thickness on these things. For my meal, I ordered a 3D burrito which comes with papas, a choice of meat and chile. Most of my friends also ordered the 3D as well, with variations on the meat and chile. My cousin ordered a combination plate just so that she could have a side of posole, to which I mocked her openly. I have a deep, abiding bitterness towards hominy–it’s just gross. But I did acknowledge the fact that it was cool that posole was an option as a side item, not something that I find is standard at most restaurants. So I’m not sure which level of chile I had smothered all over my burrito, but that’s okay. Because my burrito was delightful. In fact, I’m going to go out on a very corny limb and suggest that the 3D in the burrito stands for delightful, decadent and delicious! I say decadent because the burrito was huge. I didn’t even finish half the burrito and remember, I was this close to eating my friends before we walked into the café. The chicken tasted fresh, the papas were cubed and fried to perfection and then there was the green chile. I sweated. I cried. The chile was so hot it burned my lips and I fell in love more with each bite and each tear. Everyone else commented that they enjoyed their food as well. I will say the green chile was preferable to the red chile. Those at the table who got the red seemed a bit disappointed over the lack of heat, and I sensed their envious and bitter looks out of the corner of my eye. But that also could have been just looks of embarrassment as I was making odd moaning noises after each bite. I’m telling you, the green chile was good. 3D burrito with chicken and green chile. And here’s how you really know Horseman’s Have Café is worth trying out. My cousin insisted I try her posole. I did and guess what? It was great! I might even try it as a side when I’m at Horseman’s next time. Maybe. If the hominy behaves itself. **I went back to Horseman’s in August and asked to have a side of Level 2. I did warn the waitress that if I cried to not take it personally, that it was just likely me being too wussy for the chile. She said that Level 2 only comes as a side, it’s way too hot to have smothered on your food. I put some on my stuffed sopapilla (not as good as the 3-D burrito, but good) and took a bite. It was the hottest, most flavorful chile I have ever eaten. Like seriously, four hours later I could still taste the chile on my lips. Totally worth it. And I didn’t cry! So You Want a Little Breaking Bad with Your Donut? The Beatles Lied: A review of Casa Blanca’s Fried Green Chile Strips which are, in fact, all you need.